Six representatives from community groups spoke about suicide prevention Thursday at the Durango Public Library. San Juan Basin Public Health expects to hold similar events to keep the community informed. Efforts to address the high rate of suicides in La Plata County will expand in scope next year, community group representatives said Thursday at a forum. A panel of six experts highlighted new programs and plans for 2019 at a gathering at the Durango Public Library that drew more than 50 attendees. The talk featured updates about the suicide-prevention work being undertaken by specialized nonprofits, Durango School District 9-R and the Southern Ute Indian Tribe. 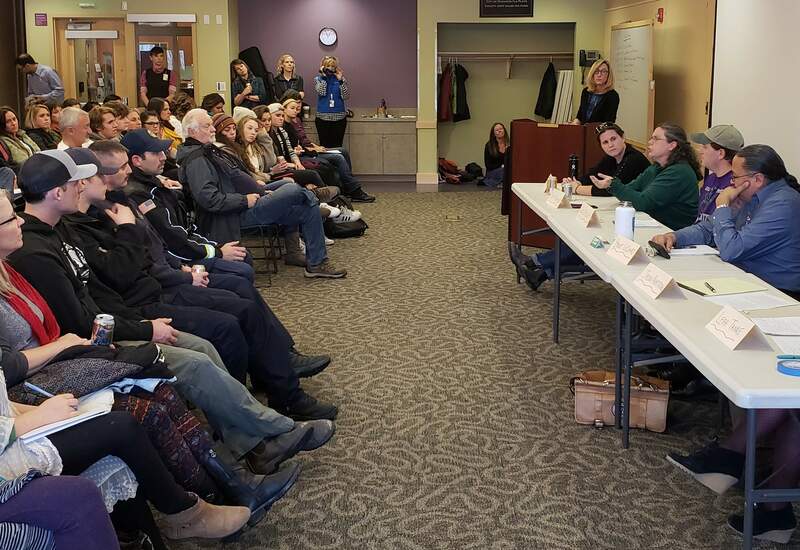 KDUR radio reporter Sarah Flower spoke about Creating Connections: Solutions to Youth Suicide in La Plata County, a series published this fall in The Durango Herald and aired on KDUR. Many of the suicide-prevention efforts began as an offshoot to a community summit hosted in May 2017, shortly after the death of a La Plata County teenager. The founder of Resilient Colorado, Doty Shepard, said her new nonprofit is focused on training individuals to deal with trauma in their lives and educating organizations and agencies, such as schools, how to respond to traumatized people. “Resiliency is something that can be taught,” she said. Shepard’s work is based on a Kaiser Permanente study that found those with four or more adverse childhood experiences – such as physical abuse, sexual abuse, neglect and some forms of family dysfunction – are far more likely to die by suicide and experience a multitude of other consequences such as heart disease and substance abuse. In the short term, she expects to teach 12 sessions about trauma and resiliency to students at Big Picture High School. She plans to start working with professionals – such as social workers and firefighters – who may experience second-hand trauma, to better equip them to cope, she said. Durango School District 9-R introduced Sources of Strength, a suicide-prevention program, this semester that has been well received, said Leah Tanke, coordinator of school counseling. Sources of Strength focuses on promoting support networks that lead to well-rounded lives, such as family, friends and mentors. The student-led program was a welcome change from curriculum focused more directly on suicide intervention, she said. “People were just really ready for this,” she said. The program is expected to mature over the next few years and reach more students, she said. The CODY Project, which stands for Communities Overcoming Depressed Youth, plans to increase its outreach next year, said Greg Felsen, the county’s 4-H extension agent. The project recently started a monthly support group for families with youth who are experiencing depression, anxiety and suicidal thoughts. It is also planning to host four large events next year, similar to its Mental Health Mardi Gras, which featured games, workshops and opportunities to talk with mental health professionals, he said. “Our biggest thing is getting out our message that, ‘You matter,’ he said. The Southern Ute Indian Tribe is working on an action plan around suicide prevention, increasing awareness about suicide and holding suicide-prevention trainings, called SafeTALK, among other efforts, said Bruce LeClaire, CEO of the Boys and Girls Club of the Southern Ute Indian Tribe. SafeTALK focuses on how to talk to someone who is feeling suicidal and make a plan to keep that person safe. San Juan Basin Public Health is leading a countywide suicide-prevention effort to address suicide prevention through a steering committee and individual groups working on niche topics, such as a community-response plan to deaths by suicide. SJBPH is also offering mini grants to organizations that are working on suicide prevention, said Jason Armstrong, Thriving Youth Programs manager for the health department. The health department will likely offer additional grants in about six months, said Claire Ninde, spokeswoman for the agency. Additional similar forums are planned twice a year to keep the community informed about the collaborative’s progress. Those interested in participating in SJBPH suicide-prevention work can contact Kate Jones at 335-2084 or kjones@sjbpublichealth.org.